I absolutely hate taking care of floors, first the sweeping, followed by lugging a heavy pail and mop around, are so NOT my idea of fun. My flooring is inconsistent (which of course doesn't help matters), some is hardwood (un-treated hardwood to boot so sometimes it eats the broom straw and the mop fibers), some laminate and some tile, making it a monotonous and time-consuming undertaking. I'm all for saving both time and money, and finding a product that helps me to do both is the closest to 'cleaning nirvana' there is! and some additional research on where to buy the product can also yield some extra and unexpected benefits! Ƹ̵̡Ӝ̵̨̄Ʒ - Allows you to skip using harsh chemicals (perfect for those with severe allergies, sensitivities and Ashthma) because you use just water to eliminate 99.9% of germs and bacteria - clean and sanitize naturally! Ƹ̵̡Ӝ̵̨̄Ʒ - Easy to use: With Easy Touch Digital Controls, 5-way adjustable handle and a Quick-Release Mop Pad Tray, you'll literally power through your Spring Cleaning in no time! I LOVE not having to use extra chemicals to get my floor clean, and in this case, not just clean - but clean AND Sanitized! The microfiber pads can be removed and tossed into the washing machine, so you not just save time with it allowing you to vacuum and mop at the same time, but you also save money on not having to run out and buy replacement pads so often (not to mention not having to buy additional chemical cleaners!) - you save both time, AND Money! What's not to love about that? Are you ready to ditch your mop and broom butterfly? How is your Spring Cleaning Coming Along? FTC Disclosure: This is a Sponsored Post. This post also contains affiliate links. I am disclosing this in accordance with the Federal Trade Commission 16 CFR, Part 255 - Guides Concerning the use of endorsements and testimonials in advertising, you may check our Giveaway and Disclosure Page for additional information regarding Ascending Butterfly Disclosure. I was selected for this opportunity as a member of the Best Buy Ambassador Blogging Program, all opinions expressed here are all my own. I love that I can utilize it for my ceramic tile as well. @Maria - It really works well on ceramic tile! That's what I have in the bathroom and I love being able to truly sanitize the bathroom floor! Now this this is what the doctor ordered . 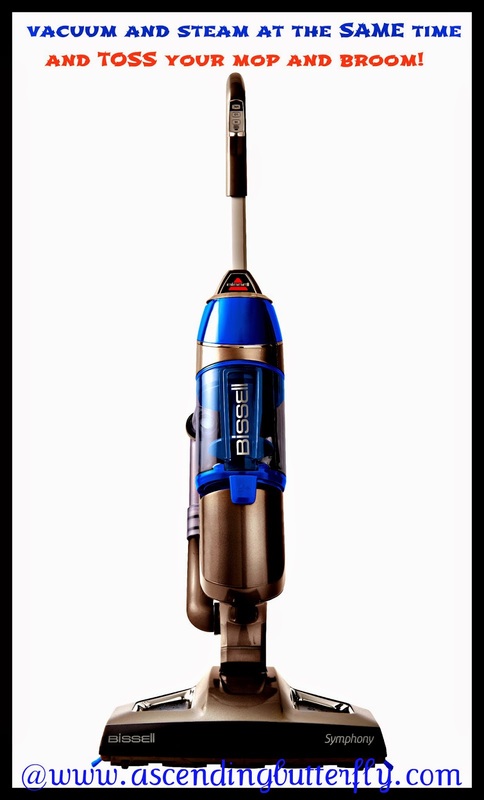 Saving is great but not at the expense of proper cleaning,so I'm sold on this Bissell symphony and its light and easy to work with .